This is a homepage for a grieving father who yearns for just one miracle. He wants to know what happened to his daughter, Kimberly Diane Greene Medina. She was only 19 years old, married, and the loving mother of her two beautiful young daughters, Nekka and Marissa, aged 3 and 2 at the time of her disappearance. Her sisters, Kindra and Stephanie, and brothers, Joseph, Kevin and Brendan, miss her dearly. 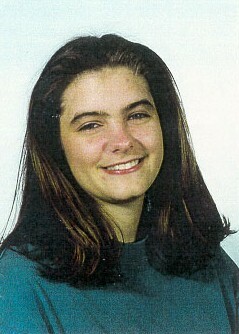 Kimberly disappeared on a cold night in late October 1996. The extensive search for her has provided few leads for police and left little hope for her father. "Kimmy should not be a missing person." says John Greene, Kimberly's father. "She has so many people out there who love her." "She would never have left her two little girls." says Jennifer Greene, Kimberly's stepmother. "She loved them dearly." Kimmy vanished October 29, 1996. Her husband reported her missing two days later, saying her destination had been a convenience store at the corner of Buckley and Mississipi in Aurora, Colorado. No one has seen or heard from her since. "We will never give up looking for her. It has been 3 1/2 years now, but she is worth ever minute we search for her. She was so dear to me." says Kimmy's "Aunt Stephi", Stephanie O'Bryan. Kimmy's frantic family, friends and co-workers have distributed thousands of flyers around Colorado and the surrounding states, as well as in truckstops across the country. Her disappearance has been featured three times on the "Leeza Show" and several stories have been written in local newspapers in the Denver metropolitan area. Her family has held press conferences pleading for people to come forward if they have any information about her disappearance. They have searched mine shafts, manholes, abandoned missile sights, fields, pastures, and many other places all over the state....all to no avail. They have contacted friends of Kimmy's back to as early as elementary school, and co-workers of hers at jobs she held in the past. No one has heard from her or seen her. There has been no activity on her social security number nor any activity on her driver's license. Her paycheck remains unclaimed at her place of work. At the time of her disappearance, Kimberly was 5'5" with light brown shoulder-length hair, the most beautiful big blue eyes and long dark eyelashes, and weighed approximately 130 lbs. She was wearing her light weight jacket from work--ocean blue with yellow letters saying Supershuttle, blue jeans, maroon sweatshirt, tan hiking boots. "If anyone knows anything about my daughter's disappearance, please, I beg of you, come forward and end this terrible nightmare!" pleads John. Please use your "back" arrow to return to the previous page.